Garmin 2620 my GPS worked fine up until the other day, now when i turn it on it gets to the "loading map information" page and shuts off, then turns itself back on in an endless loop, nothing happened to prompt this i have had the unit for over 2 years now and it has never had an issue? please help. My GPS power on, display warning screen,then "Mape Update Notice" with three botton, which don't work. Unite is "Freese" and no react, for touching the screen. My GPS power on, display warning screen,then "Mape Update Notice" with three botton, which don't work. Unite is "Freese" and no react, for touching the screen. Push Menu-Find buttons at start and you will see a diagnostic screen like this. If it says that the cornice drive is removed then you could hardly fix it your self. Yup, keeps recycling, when trying to load maps. Can hear hard drive clicking, Garmin supported my thery, unfortuneatley that it needs a new hard drive $275 for refurb, hardly worth it. That's why I love my 2610, only a CF card. Has anyone been able to by-pass the hard drive with a card reader? even if it has to hang off the side? Takes 10 mins to pull the unit apart, I did it last night & was wondering if another storage media could be installed? I have the same problem of the screen recycling. I was curious to know if there is a way to reboot the hard drive? It is such a disappointment that the system crashed with no warning or rationale. I have the same problem of the screen recycling. I was curious to know if there is a way to reboot the hard drive? It is such a disappointment that the system crashed with no warning or rationale. I have the same problem with my 2620. Worked fine until I tried to laod the City Nav 2009. Tech Support said to copy a large map to the unit - which I did. Now it keeps recycling. Diag screen says the Cornice Drive is Removed. I have the same problem with my 2620. Worked fine until I tried to laod the City Nav 2009. Tech Support said to copy a large map to the unit - which I did. Now it keeps recycling. Diag screen says the Cornice Drive is Removed. Had it for 5 years... start screen and warning page, then loading maps, powers down, loops over and over, makes a soft clicking sound every second or two during process .. im ready to go buy a cheapy, paid 1100 for this one. Worked fine until yesterday, posted 11-14-08. Had it for 5 years... start screen and warning page, then loading maps, powers down, loops over and over, makes a soft clicking sound every second or two during process .. im ready to go buy a cheapy, paid 1100 for this one. Worked fine until yesterday, posted 11-14-08. My Garmin 265T did the same thing after only 1 week from new. I drove kids to school with unit working on where am I map and then after 5 minutes returned to car and unit started looping. I had updated maps and speed camera database at weekend but unit worked fine for 3 days then suddenly went. I have returned unit for replacement but interested to see if can be prevented or is it to do with updating maps. I shall leave update this time and put on long term test My Garmin 265T did the same thing after only 1 week from new. I drove kids to school with unit working on where am I map and then after 5 minutes returned to car and unit started looping. I had updated maps and speed camera database at weekend but unit worked fine for 3 days then suddenly went. I have the EXACT same problem! Anyone know a fix? I called Garmin support and explained the problem (whic, fo me, began with trying to load the 2009 map I had just bought). Garmin Tech Spt said my unit probably had a bad hard drive. They provided a RMA #, I sent the unit in for repair and they sent me a new/refirbished unit. Be careful, it restarted my brand new desktop mega computer, and a message came up, "recoeverd from a serious problem, notify Microsft." Dont think that was a very good thing for my computer. Did it twice. I was able to replaced the defective drive with a MPIO HS100 1.5GB cornice drive. See link for addition write up. I have the same issue. The hard drive in the GPS is gone. The only way to fix is to send the unit in to Garmin for repair. It costs $275. It is cheaper to buy a 2610 at eBay. I just did that. It is identical to the 2620 with the exceptions of the removable CF card. It is lot better and longer lasting device. You are caught in a loop most likely caused by a failed microdrive. Search Garmin 2620 cornice for a thread that is likely to provide the information about the failure you are experiencing. In short, if it is the Cornice drive that has failed you will find it very difficult to repair, if not impossible depending on your level of expertise and ability to find a used part for repair as the drives needed are no longer manufactured or readily available. connect your GPS to your PC and load your local maps to the hard drive. Maybe update your firmware as well. Good luck. Connect it to a PC and delete the map(s) using windows explorer. There is no reset button. Every time you turn off your Garmin and turn it back on it reloads everything fresh. What is likely the cause of what you are experiencing is a failed Cornice microdrive. It is near impossible to fix with the parts available today (May 2010) and it is more time management and cost effective simply to purchase a working 2610 from a third party site, or to purchase a new unit from the store that is still supported. In addition to the parts issue Garmin discontinued Map support for the 2620 (and 2610) in 2009. Most likely your hard drive is gone bad. Push "menu+find" buttons then turn on, you will get diagnostic screen, it will show if your cornice drive is bad. It will say"Cornice Dive removed"
In February I posted that I will replace the cornice drive on my 2620 because I had this problem Well I did that, but could not fix the problem. Garmin is asking $275 to replace my unit, I did not wanted to pay them that much. So I bought a 2610 at eBay for a $100 and don't have to worry about hard drives any longer. To get this screen on a GPS push "menu+find" and then turn on unit. It will show this diagnostic screen. I need map update for my Garmin 2620. Anyone know where I can find an update? Garmin says they no longer support the 2620. My garmin will not load maps and cycles like it is trying to turn on. Is there a way to reset the device or is it toast? 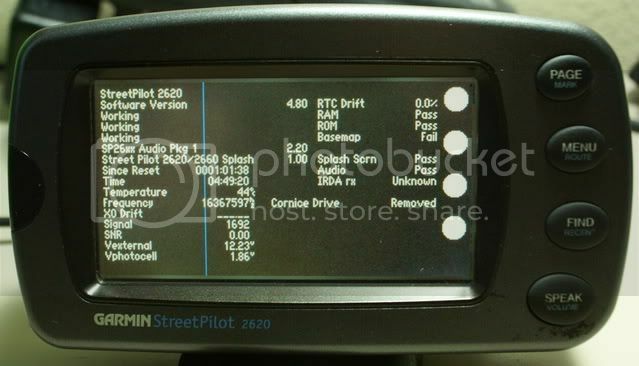 Have a manual for Garmin StreetPilot 2620 GPS Receiver?